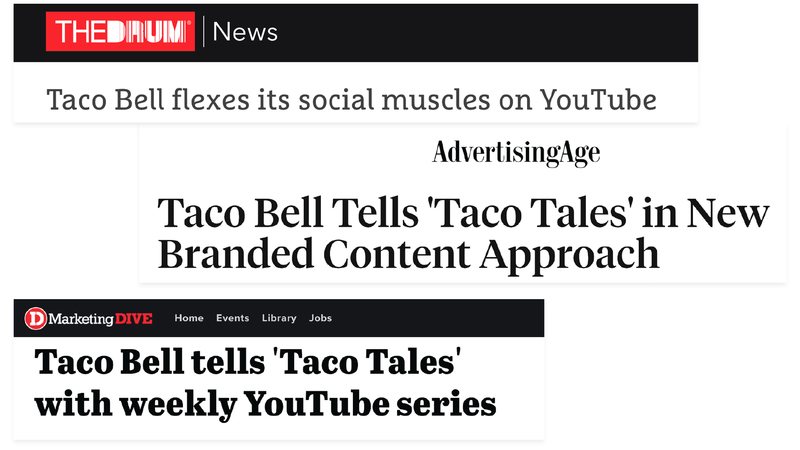 To increase affinity with their target demo and grow their social presence on YouTube, Taco Bell engaged Madison + Vine to develop and produce the brand’s first-ever digital comedy series, Taco Tales. Breaking from their traditional advertising and social media outreach, the brand ignited conversation, social sharing, and content discovery across the platform. Pulling actual consumer storylines from Twitter and Reddit, the series was a major hit fueling the brand’s uptick in positive sentiment and organically growing Taco Bell’s audience on the platform. Following distribution, Taco Bell experienced an immediate uptick in positive sentiment and audience retention. Fans began to tune in every week for new ‘Taco Tales’ and even submitted their own stories to join in on the movement!